... 2010 (today), it be International Talk Like a Pirate Day. Created by a couple of parodic Oregonians in 1996, the holiday's since sailed across the bounding main. Not U.N.-recognized but fun, mateys. Though a wee bit male-dominated in cyberform. 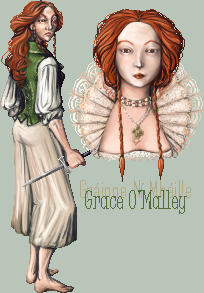 Heave to, ye 'Grrls, and talk a while like yer foremother Grace O'Malley (image credit), and her sister pirates. Arrrrrrrr.